It is time for a new sketch challenge at Stuck On U Sketches - this time a sketch by Nanné Harry. I really dreaded this sketch and postponed my start on it for a very long time because there were so much stuff on it, but when I started it was so easy to use. 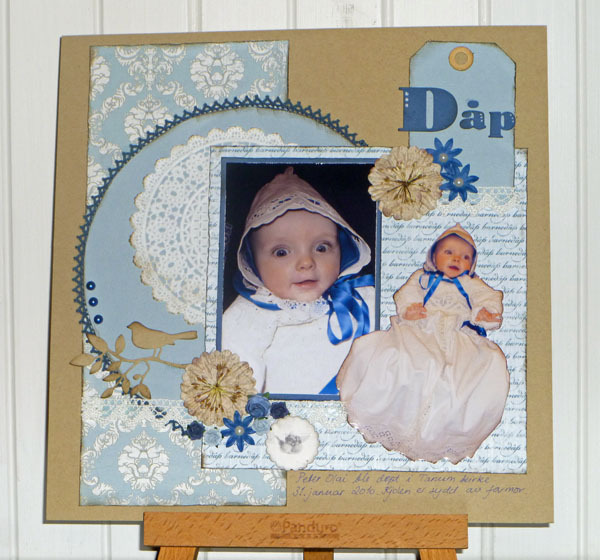 I have used pictures of my little boy from his Christening. He is so cute in the dress my Mother in Law made. Papers are from one of my favourites - the norwegian producer Papirdesign, and I have used flowers from Prima and flowers and lace from my local craft store. Thank you for coming by, and please visit my fellow DT-members at SOUS. great job on the sketch, Stine! Those pictures are adorable and the papers beautiful!